The Text of the Gospels: The English Hexapla - You Should Get This! Usually when the term “Hexapla” is used, it refers to a project of the third-century theologian Origen in which the text of the Old Testament books was arranged in six columns, presenting (1) the Hebrew text, (2) a Greek transliteration of the Hebrew text, (3) the Greek version prepared by Aquila, (4) the Greek version prepared by Symmachus, (5) the Septuagint version, and (6) the Greek version prepared by Theodotion. 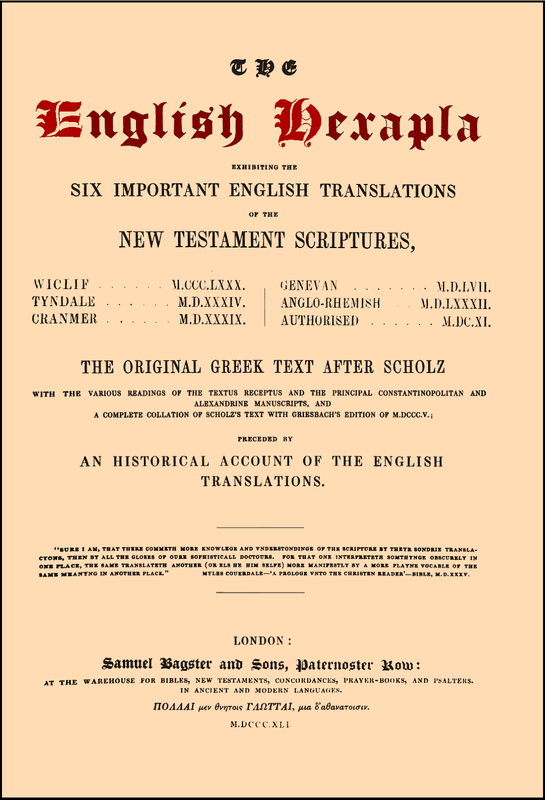 The English Hexapha (1841) is different: instead containing six Old Testament texts, it presents six English translations of the New Testament: (1) Wycliffe’s version (based mainly on a manuscript from 1388), (2) Tyndale’s version of 1534, (3) Cranmer’s version, also known as The Great Bible, of 1539 (4) the Geneva version of 1557 (5) the Rheims version of 1582, and (6) the King James Version of 1611. Thus, in a single volume, readers are equipped with the means to consult most of the major English versions of the Reformation period. Some differences in different versions are thus detectable even without knowledge of the base-texts used by the translators. The English Hexapla also includes a valuable and informative review of the history of the Bible in English up to the publication of the King James Version in 1611. This review is divided into three parts. Part 1 concisely reviews Caedmon, Bede, Aelfric, Alfred the Great, and Richard Rolle and their contributions to the spread of the written Bible in English, in a single chapter. The next five chapters pertain in one way or another to the Wycliffe (or Wycliffite) Bible; chapter 3 features some interesting data about the Comma Johanneum. Part 2 describes the work of Tyndale, and the ecclesiastical and political milieu in which his translation made its debut. There are some interesting and moving accounts about people who were martyred in England for the crime of possessing and reading the New Testament, as well as an account of Tyndale’s own martyrdom. Part 3 describes the sequel of Tyndale’s work, especially the determined efforts of Myles Coverdale, whose efforts to spread the English text of the Bible involved not only studiousness and erudition but also exploits of the most dangerous sort. Coverdale studied the translations that had preceded his work, and stated “Sure I am, that there commeth more knowledge and understandinge of the scripture by theyr sondrie translacyons, than by all the gloses of our sophisticall doctors.” The English Hexapla also reports the reasons – some clear historical facts, some likely deductions – for Henry VIII’s change of heart on the subject of whether the Bible should be circulated in English. The rise of translators’ freedom in England during the reign of Henry VIII, the influence of Oliver Cromwell, the dangerous reign of Mary Queen of Scots, amd the more peaceful reign of Elizabeth, is documented, and the backgrounds of the English versions presented in The English Hexapla are all described. Besides details about the background of the work of Tyndale, Cranmer, and Coverdale, there is an interesting section on the significance of the mysterious initials that accompanied portions of the Bishops’ Bible published in 1568: the authors believes them all to be initials of the scholars who prepared the text, and in addition to their names he provides brief biographies. The Rheims version of 1582 is then described, although perhaps roasted would be a better term. The author mentions a composition which appeared the same year, in which Gregory Martin objected to various features of the earlier Protestant English versions; Dr. Willian Fulke promptly composed a response; this exchange may account for some of the differences between the KJV and the English Protestant versions which preceded it. The King James Version is the focus of the last chapter of the review of the history of the English Bible before the Hexapla itself begins. If you are unfamiliar with what the Millenary Petition was, or if you would like to know a few specific readings that Dr. John Reynolds found objectionable in previous English versions, or if you want to learn which marginal notes in the Geneva Bible were especially opposed by King James, and similar details that led to the launch of the great translation-project in 1604, this chapter must surely be a priority. And if you want to read the fourteen rules that the translators were instructed to follow, this, to, can be learned in this chapter. The names of the members of each company of translators are also provided, with some brief biographical details. Two brief and helpful supplements appear before the sixfold comparison itself commences: a description of the format in which the six versions are presented, and a collation of the Greek compilation prepared by J. M. A. Scholz (published in 1830-1836)– which accompanies the English translations’ text on every page – and the collation made by Griesbach in 1805. Although Scholz’s compilation was denigrated by Metzger (cf. The Text of the New Testament, p. 124), and Scholz himself later assigned greater value to some Alexandrian readings, it is not drastically different from Griesbach’s compilation: all of the differences between Scholz’s compilation (proof-read and revised especially for The English Hexapla) and Griesbach’s compilation are listed (even trivial differences in the spelling of the word “Moses”) in just four two-column pages. (Although modern editions tend to agree with Griesbach more often than with Scholz, this is only a tendency.) If you want an example of the results of textual criticism before Westcott and Hort introduced a transmission-model that drastically favored the Alexandrian Text (and before the discovery of the papyrus copies used in Egypt), you have come to the right place. 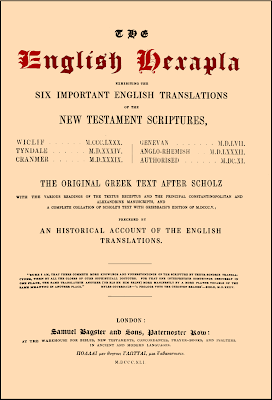 Those who possess a copy of The English Hexapla not only have a detailed account of the development of the English Bible, but also accurate transcriptions of the New Testament books as they appear in six of the most important English Bibles of the Reformation period, and a generally excellent Greek New Testament. Those who must obtain a hefty three-inch thick paper copy of The English Hexapla can obtain a facsimile from the GreatSite website, where they are advertised with the purchase-price of $95.00. If you prefer to obtain The English Hexapla for free, in digital form – as a 101,097 KB file – then you can download it from Google Books (use the little gear-like icon in the upper right corner of the page and in the sub-menu select “Download PDF”), or use this Google Books copy. Readers may also want to obtain a review of The English Hexapla which also appeared in 1841, in the journal The Eclectic Review, and which challenges and supplements some of the claims made in its account of early English versions. The English Hexapla can also be downloaded from the Internet Archive site, which presents a copy held at the University of Toronto, and which can be obtained not only as a PDF but in other formats (such as EPUB) as well. Thanks, James. Do we know who wrote and compiled this Hexapla? As far as I can tell, it was intended to be anonymous. Even in the contemporary journal The Eclectic Review, the author is only identified as "Our author." William Tyndales later 1534 revision is the text in the Hexapla, not his original 1526. Excellent review! Thanks for the correction; I have adjusted the text in the post accordingly.